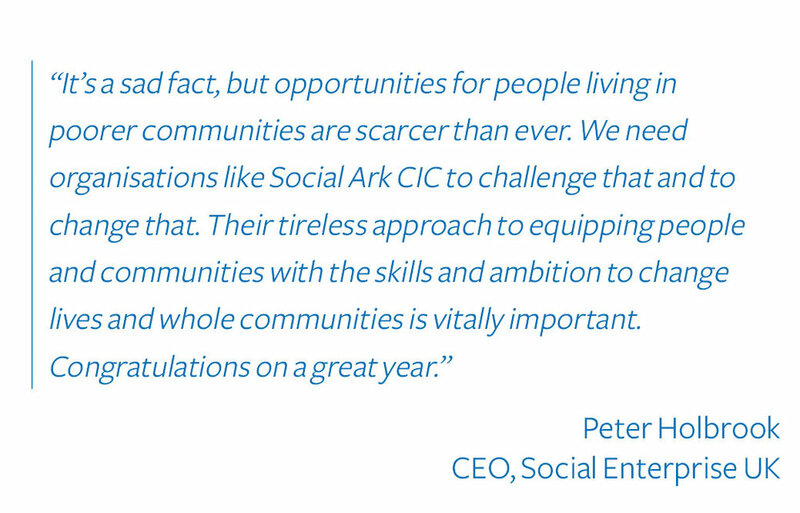 Social Ark supports disadvantaged young people to use their lived experiences to start social businesses, but we can't do it alone! We are currently looking for corporate partners to embark on our journey and be part of our new Step Up programme, starting in April 2018. Join us to empower local young people to become social entrepreneurs, transforming their lives and the communities around them! We understand that our corporate partners will also have their own specific goals and outcomes.By tailoring the partnership offer with clear goals and metrics, our collaboration will have a positive impact and achieve mutually beneficial objectives. We are confident that partnering with us will add credibility to an organisation’s purpose and overall corporate social responsibility strategy (CSR). Positive brand association: Engaging with Social Ark CIC will demonstrate a positive connection with the wider community. It will publicise your commitment to diversity and inclusion by enabling and empowering disadvantaged communities to flourish. Partnership Acknowledgments: Corporate partner branding will appear on all online and printed promotional material, including our website, social media and mailing materials. Social Ark will promote the partnership across its network. Staff Engagement: Corporate volunteers have told us that working with us has benefitted them in many ways. They’ve reported that by directly mentoring disadvantaged young people and supporting them to become social entrepreneurs, it has taken them out of their comfort zone and has helped them in their own personal development. Examples include thinking more creatively around shared values, leadership, decision-making and negotiation skills. Innovative service solutions: The skills that employees learn through volunteering with Social Ark can be directly transferred into your business and provide creative, forward-thinking solutions. We will introduce them to our core values, which we hope will empower them to create a more respectful, diverse and inclusive working environment, resulting in a higher level of customer and employee satisfaction. We are always looking to partner with other like minded organisations to create opportunities for disadvantaged young people in the local area. If you are interested in partnering with us, please get in touch!